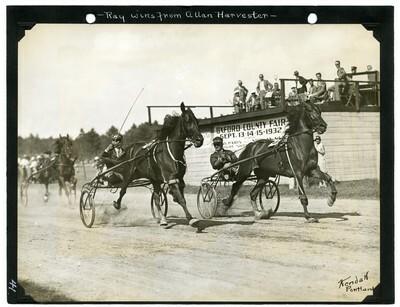 Sepia tone finish line action photo of bay gelding, Ray beating out Allen Harvester in the 2.22 Trot at the Western Maine Agricultural Exposition, Gorham, Maine, August 1932. In the background, members of Hanson's Orchestra can be seen atop a platformed area. On the front of the platform, a banner promoting the Oxford County Fair appears. Kendall's signature in India ink appears in the lower right corner of the photograph.